Ransomware, once just a consumer scourge, is increasingly holding enterprises hostage. As evidenced by recent cyberattacks, these assaults have crippled critical infrastructure providers, hospitals, businesses, and government networks, on a global scale. 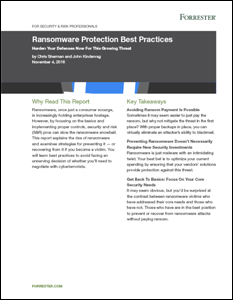 Download this report to understand the rise of ransomware and strategies for preventing it — or recovering from it if you become a victim. You will learn best practices to avoid facing an unnerving decision of whether you’ll need to negotiate with cyberterrorists. Learn more about how Forrester can help at your on-demand and live events.